Marta Lopez at John Muir elementary in S.F. Wealthy parents are more likely to make cookies for bake sales, volunteer in classrooms and be otherwise involved in their children's schools than lower-income mothers and fathers. That's the conclusion of a survey of California public school parents released Thursday. Yet even parents with greater financial resources are reluctant to spend hours at meetings or on school committees - even though that's where the money decisions are made. Just 1 in 4 parents said they had ever participated in school committees, according to the survey of 1,003 parents. But with the state putting more budgeting power in the hands of local districts and schools, education leaders have an obligation and an opportunity to bring more parents to the table, said Louis Freedberg, executive director of EdSource, an Oakland nonprofit education research organization, which sponsored the survey. The new education funding system is based on student enrollment and gives more money to schools with higher numbers of English learners and low-income students. The law, signed by Gov. Jerry Brown in July, requires schools to include parents - and specifically low-income and English-learner parents - in the budgeting process. "There had been no other poll, really, that drilled down to give us a baseline to see how involved parents are, what the attitudes are to their schools," Freedberg said. "We asked parents what it would take to get more involved." The answer: Parents want to participate more, but schools need to make it easier, Freedberg said of the results. "Parents are more likely to cite a lack of time, rather than a lack of interest or a system that is unreceptive to their input, as an obstacle to greater participation in advising and decision-making," the survey concludes. Parents want translators, advance notice of meetings, weekend options and perhaps most importantly, they want to know their input matters, the poll found. 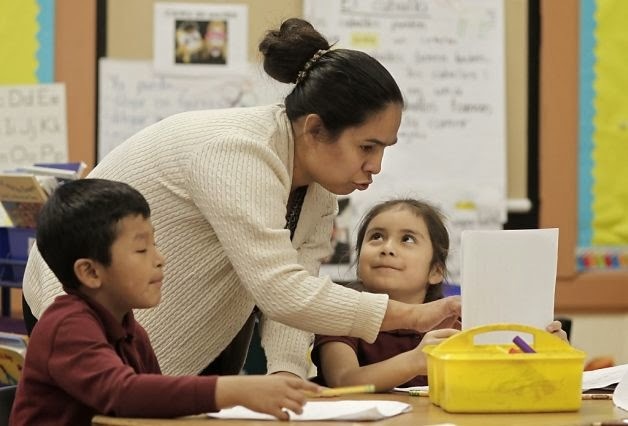 San Francisco school officials have already been working on that, offering community meetings in various languages to explain the new funding system to parents and encourage involvement. The district already uses a budgeting process that incorporates parent input at each school. "They know their kids the best," said Myong Leigh, San Francisco Unified deputy superintendent. "That knowledge comes to bear in the school planning discussions. It really helps complement the work the teachers and administrators are doing." Yet getting parents involved in the new funding process at all schools is a top priority for the California PTA, said state President Colleen You. "PTA really feels it's absolutely essential that parents are comfortable, engaged and informed," she said. "Every parent has something to offer based on their expertise in being a parent." Local PTA parent academies are part of the organization's efforts to increase participation, as well as statewide outreach efforts. "Parents don't automatically become advocates," she said. "But 30 years of research really proves student success improves when parents are involved and engaged." The survey was taken between Nov. 5 and 12. It has a margin of sampling error of plus or minus 4.4 percent. -- 39 percent of parents with incomes greater than $100,000 said they were very involved in their children's schools compared with 24 percent of parents making less than $30,000. -- Two-thirds of parents said time and work schedules were obstacles in participating at their children's schools.